This is still availabe if you haven’t requested one yet. 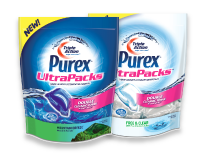 Sign up to receive a free sample of either Purex UltraPacks or Purex Liquid Detergent. They are giving away 15,000 samples today.